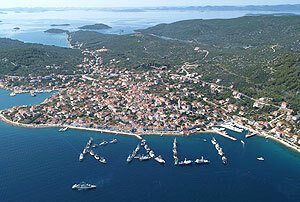 We are extremely honoured to invite you to spare a little time and visit our web sites where we present our town Kali on the island of Ugljan, the biggest town on the islands around Zadar. Constant connection with Zadar through car-ferry services makes your arrival to our island and town easier. You can also get to know the wider area of our region, through our organized excursions, especially the pearl of Adriatic – Kornati, the Krka Falls, as well as many other islands around Zadar and going on an unforgettable fishing excursion. We are sure that your will recognize our little, beautiful town as a destination where you will spend Your well-deserved vacation, so we are looking forward to your arrival. Kali offers you over 800 beds within many lovely houses. Read and learn something new about our history. Get to know our closer and wider surroundings. Enjoy our traditional Dalmatian cuisine. Find out all about ways to reach to Kali.